It happened again, I sat down to write a specific blog and a completely different one came out. I swore I wasn’t going to do this, but I'm compelled. As are the subjects of this commentary. Our world is changing, rapidly. Yesterday, I watched an interview with retired Navy Seal, Kristin Beck, who is now a transgender. The interview was a response to Caitlyn Jenner’s ESPY Award speech. (I have to say, in my opinion, there are others who were far more deserving of the honor, but this isn't about her, so I'll leave that alone.) Ms. Beck's follow-up comments were, to say the least, upsetting. No matter how strong 20 years as a decorated Navy Seal had made her, when four guys jump you at one time, you’re done. Can someone enlighten me as to what threat she posed to their lives? (Sorry, I’m back to asking questions.) Oh, that's right, because she had suppressed a fundamental drive, (which was realized in childhood,) and couldn’t deny it any more, she deserved to be beaten. Sadly, she said it happens regularly in the transgender community. Who would purposely bring ridicule and peril on themselves unless they were undeniably compelled to do so? You must really need it to put yourself in that position. What a colossal hullabaloo is going on over the airwaves about equality, in all forms. Where this one is concerned, Ms. Jenner has kicked things into high gear. Okay, here’s my biggest question for all of it, why is any of it our business? Because in no way that I slice that presumption, does it add up to a full loaf. There's something desperately lacking in us if we think we have any business passing judgment on another person, especially when all they’re trying to do is find their way. Here’s an interesting statistic, in my old hood, and I mean just within the circle of people I know personaly, three men, (they do not know each other,) in the last five or six years, declared their true selves and came out. Each of these accomplished and intelligent men, waited until their children were grown, then, the charade had gone on long enough, they couldn't deny the truth any longer. Society is changing. Thank goodness. People shouldn’t have to hide for more than half their lives, then strike a devastating blow to a family configuration that, if they felt free to be who they were, would never have been formed in the first place. There was recently an upsetting thread that transpired over Instagram, involving a HONY picture of a young boy who was on the verge of tears: his face painted such agony. In the exchange, he shared he was gay and was scared of how he was going to be treated. It literally broke my heart. I wanted to reach in and retrieve him from the picture and rock him in my arms. I ached for him. There are always a lot of comments on Mr. Stanton’s posts, but this one was blowing up. I believe they took it off the site, because it caused too much of an uproar. I wouldn’t say the reaction was evenly mixed, because, encouragingly, there were definitely more good comments than bad. A great many of the negative comments were people who were indignant; declaring a child that young would have no idea if he was gay or not. Not so. Ric, was the final in the trifecta of rapid losses I wrote about at the inception of this blog. He was a man I considered a best friend. We met in high school and hit it off right away, kindred spirits. (He took his final bow with class, it was a stroke that induced sleep; sitting in his favorite chair, watching TV. Too young, but perfect. A person that good deserved a peaceful death.) He was one of a small circle of people in my life who could always make me laugh. (I covet those relationships.) Ric was gay. It took him years into his adulthood before he could come out and I don’t think the subject was ever really broached with certain immediate members of his family. Don’t ask, don’t tell. (He is with them now and there's no need for secrets anymore.) He and I talked about it at length and he said he knew who he was from early childhood. His unquestioning sincerity left no doubt about his earnestness, I have no reason to believe he wasn't telling the truth. And I can certainly relate, I remember being attracted to a boy when I was 10. It was fundamental to who I am. Just as his attractions were to him. The same is true with the child on the, Humans of New York, feed. There is entirely too much pain crushing his small frame for it not to be an honest expression of his true essence. The bigger issue is the fear he was forming. Unfortunately, it’s defensible. Historically, society has been brutal on the homosexual community, (some countries still consider it a criminal offense.) Things are changing though; we are approaching the tipping point. At least in the United States. The evolution of equality is poised to usher in a reformation. Now that openness about sexual preference has become a dialogue, it’s obvious that a great may people are gay. I figure, one of the primary reasons gay marriage got the seal of approval from the SCOTUS, votes. (Sorry, your Honors, but politicing is in everything.) Politicians are wising up, the homosexual community is too strong and established to disregard. They are legit. A few years back I watched a documentary about homosexuality, “for the BIBLE tells me so.” (That’s how the font reads on the cover of the movie.) I strongly recommend it. Gets a 98% Tomato Meter from the public. (That’s sayin something.) It represents the frustration on both sides of the homosexual fence very well. It shares the theory that homosexuality is genetic; which recent studies have verified. You can’t argue with the numbers of a subtle, but identical, genetic trait, (in two different locations along the chain,) for over 400 pairs of gay brothers. Pretty conclusive, numbers don’t lie. You can argue that you don’t like it, but you can’t deny the validity of it. But all that said, again, the real issue is what business do we have telling anyone how to live their lives in the first place? I’m fighting hard to keep my own head above water and maybe find a little fulfillment along the way, who has time to critique anyone else. Or, even better, threaten their lives because of unreasonable fears. Because that’s what it all boils down to, doesn’t it. Fear. Good ole, FDR, a president who is known for saying as little as possible during his campaign against Herbert Hoover, (can you imagine that today? I had to laugh.) In his inaugural address in 1933, he shared his oft quoted belief, “…the only thing we have to fear, is fear itself -” Of course the comment was made in reference to the Depression, but certainly, as with all profound thought, it can be applied universally. I mean, after all, isn't that the root of all the opposition, fear? Gratefully, whether those concerns are based in a moral conundrum or a physical apprehension, knowledge gives us the solvent to dissolve those fears. If we were confused about homosexuality being a choice, now we know it is definitely not. So, the moral issue has no bearing anymore. If it's imprinted on the DNA chain from conception, then God knows the deal. That solves that one. And physically, it’s certainly not contagious, so that one’s gone too. Once we have all the facts, there is no need to fear anymore. Nor is there any good reason not to repair what has been an historically unjust situation. There are quite a few gay people, (single and couples,) I know, whom I love and respect and who deserve to live in the same security the rest of us do. To be able to walk down a street and not have to fear for their lives because of the way they’re dressed, or the relationship they share. 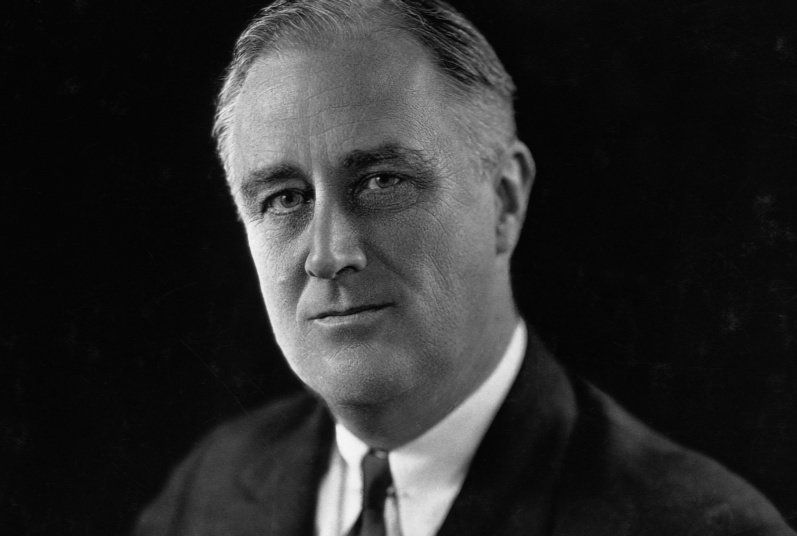 In the introduction to that same famous speech of FDR’s, before he posed the challenge of a new way of facing our problems, he reaffirmed what the American spirit stands for, “Nor need we shrink from honestly facing conditions in our country today. This great Nation will endure as it has endured, will revive and will prosper.” Again, his words have substance beyond their initial intent. We can’t shrink from anything anymore. Change is moving too quickly. And honestly facing these polarizing issues is the only way we will revive and prosper. All of us, together. Not concentrating on the foibles of our fears, but on the strength of our future. John the Revelator is another one who knew the deal, "There is no fear in love; but perfect love casteth out fear..."